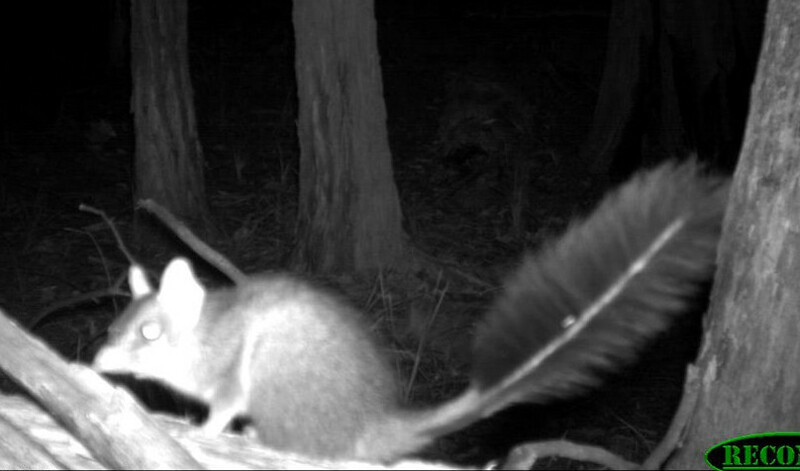 An exciting discovery has been made by the Wombat Forestcare group in the Wombat Forest just east of Trentham: the presence of the agile Brush-tailed Phascogale or Tuan (Phascogale tapoatafa). The Brush-tailed Phascogale has not been recorded in the Wombat Forest before (except in the Hepburn block) and the species are listed as vulnerable at both a State and National level. 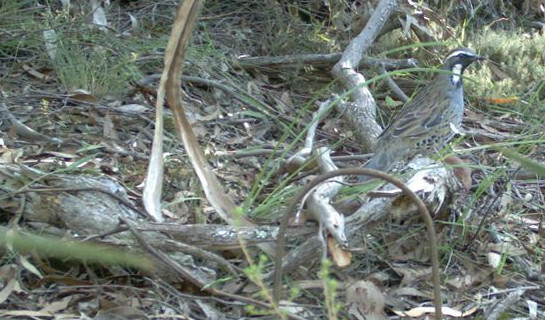 Also, a pair of Spotted Quail-thrushes (Cinclosoma punctatum), which are listed as “near threatened”, were also recorded at the same site cameras. The project has been made possible by some generous Hepburn Wind Community funding. This has allowed the group to purchase two new motion sensor cameras to monitor the native and exotic fauna species that inhabit the Wombat Forest. Project team leader Miriam Rotstein said she was “thrilled with the discovery of these two species in the Wombat Forest and that the discovery highlights the need for the forest to be better managed for its unique and vulnerable biodiversity values ”. “The project aims to ensure that we have adequate fauna records of species in the region, particularly the nocturnal species that frequent the forest”. Brush-tailed Phascogales or Tuans are small carnivorous tree dwelling mammals. They have a black ‘bottle-brush’ tail with stiff hairs up to 4cm long as its most conspicuous feature. It is a member of the Dasyuridae family which includes Quolls, Dunnarts, Antechinus, Planigales and the Tasmanian Devil. Their preferred habitat is dry, lightly treed, open forest on ridges with little or no understorey, and with mainly rough-barked trees. But Tuans also live in a variety of other forest or woodland habitats, including wetter areas. Sites usually need to have large, hollow bearing trees to act as dens, plus a range of foraging habitats and potential food sources within 500m of a den. Tuans usually nest in tree hollows in living or dead trees. Trees used as breeding dens tend to be large and old, which are very rare in the Wombat Forest, due to extensive logging activities and frequent disturbances. Research in the Jarrah forests of Western Australia found that the average age of trees used as dens were estimated to be 125-300 years. This is why is it vital that the Wombat Forest needs to be managed to ensure areas of mature forest are preserved and managed to ensure suitable habitat, and that the Department of Sustainability and Environment needs to examine its fuel reduction burn program. It is estimated that distribution of the Tuan has declined by at least 40% since European settlement and may still be decreasing. The main threats to the Tuan are widespread clearing of preferred habitat, loss of tree hollows due to logging, fuel reduction burning and firewood harvesting, predation by foxes and cats, prescribed burns and unplanned fire, drought and climate change.